Dog teething is a necessary evil for all puppies and their owners. Sometime between 2 and 7 months, your dog’s baby teeth will be replaced by her permanent adult teeth and your puppy will chew everything in sight. Since most puppies go to their new homes when they are between 6 and 8 weeks old, it won’t be long before chewing becomes an issue. A puppy who is teething, will chew on anything that is available. Dog teething – by far the most common reason for chewing. 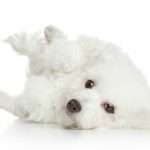 Separation anxiety – If your dog has separation anxiety, it doesn’t go away when she matures and becomes an adult. Dogs with separation anxiety chew things because they are anxious. If your dog only chews when you are not home, suspect separation anxiety. Boredom – Puppies and adult dogs alike can be bored. They all need some mental stimulation and some toys to keep them busy. Dogs, like their wolf ancestors, are carnivores, meaning that they are meat eaters. Their teeth were designed for tearing and chewing meat. Your new puppy has 28 baby teeth, and they will be replaced by 42 permanent or adult teeth by the time your dog is 7 months old. We refer to the time that is happening, as dog teething. 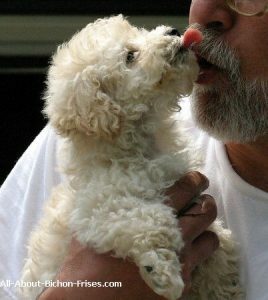 When your Bichon Frise is licking you, she is probably giving you a kiss! All your dogs’s teeth are not the same. Your pup has incisors for grasping food, canine teeth for tearing, premolars and molars for grinding food. The incisors and canine teeth are in the front and the molars are in the back of his mouth. In addition, your puppy has salivary glands that lubricate the food and start digestion. And his tongue guides his food to the back of his throat, licks up small pieces of food and laps up water. Dogs also use their tongues to show affection or subservience (being submissive). When your puppy starts teething, you will think that a tornado has hit your home. Finding ways to cut down on the damage is important, as there is no way that you can stop your dog’s chewing. 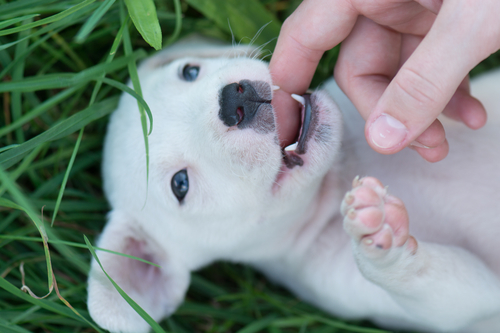 Your puppy’s teething will take several months to complete. Chewing while teething, is natural. And it does serve a purpose. Chewing on something helps the new teeth break through the gums. Just like chewing helps a human baby with its new teeth. Dog teething can be difficult for your puppy. His gums will be swollen and painful and the whole process makes him very anxious and upset. Chewing helps him find relief. Your puppy will want to chew everything in sight, when he is not sleeping! Why Not Just Stop the Chewing? In addition to helping teeth to break through the gums, chewing serves another purpose. It helps to loosen the baby teeth, so they can come out. When you are teething, furniture legs are really tempting! Occasionally, a dog’s teeth don’t come out when they should. When baby teeth are retained after the adult teeth have emerged, this leads to problems. Your puppy could end up with problems like a gum infection, problems with development of his jaw or misalignment of his teeth. You should inspect your puppy’s mouth from time to time. If you see a double row of teeth or anything that doesn’t look right to you, have your vet check your dog’s mouth. Baby teeth that don’t fall out will have to be removed surgically by your vet. 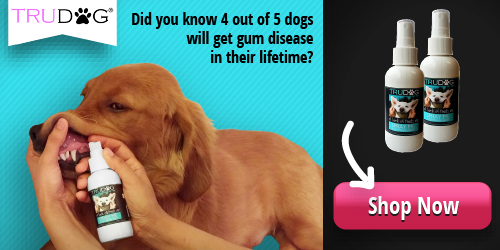 So you really don’t want to stop your dog from chewing. Chewing is natural and necessary for your dog’s healthy teeth and mouth development. However, there are some things that you can do to keep your puppy’s chewing under control. The idea is that you want to prevent your puppy from chewing your items and redirect his chewing to allowed items. Pick up personal items – This is a great way to get family members to pick up those personal items that get thrown into piles around the house. If clothing, shoes and other items are put away, your puppy can’t chew them. Confine your puppy – Keep your puppy in a confined space until his puppy teething days are over. 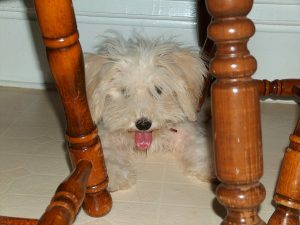 Many people choose to confine a puppy to the kitchen, as there are fewer things to chew there. Use a pet gate to close off doorways to the puppy’s room. Dog crate – Alternatively you could keep your dog in his crate when you can’t supervise his activities. This is a good idea when you have to leave the house and your puppy will be alone. Make sure your pup has toys to entertain him and water to drink, in his crate. Bitter apple spray – A dog chewing deterrent, bitter apple tastes bad to your puppy if she tries to chew something that has been sprayed. Use bitter apple spray on furniture, wall trim and personal items like shoes. Frozen dog treats – Just like babies, puppies find relief to their painful gums when they chew on something cold. Try freezing a carrot or try something like the Doggie Cone Maker. It can keep a puppy occupied for quite a while. Teething rings – A treat for your puppy, these teething rings last longer than the chew sticks. Dog chew toys – Most dogs like rope toys, even into their adult years. But a teething puppy may need an assortment of toys to keep him occupied and happy. This assortment gives you variety for a reasonable price. Dog chew bone – Nothing like a bone for a dog. This one was designed to keep puppies happily chewing for hours. Exercise your puppy – A tired puppy will sleep more. A puppy who is sleeping is not chewing. While dog teething can be traumatic for you, keep in mind that it will pass. Your dog will stop his constant chewing when his new teeth have come in. In the meantime, keep valuable things out of reach and provide your puppy with things that he can chew!